Tag line: "They Witnessed an unspeakable act! It may cost them their lives!" As a fan of 70's exploitation, Race With the Devil proved a real treat. Combining car chases and nerve-racking tension with witches spells and satanic rituals, Race With the Devil is an action-packed extravaganza that has a bit of the occult thrown in for good measure. 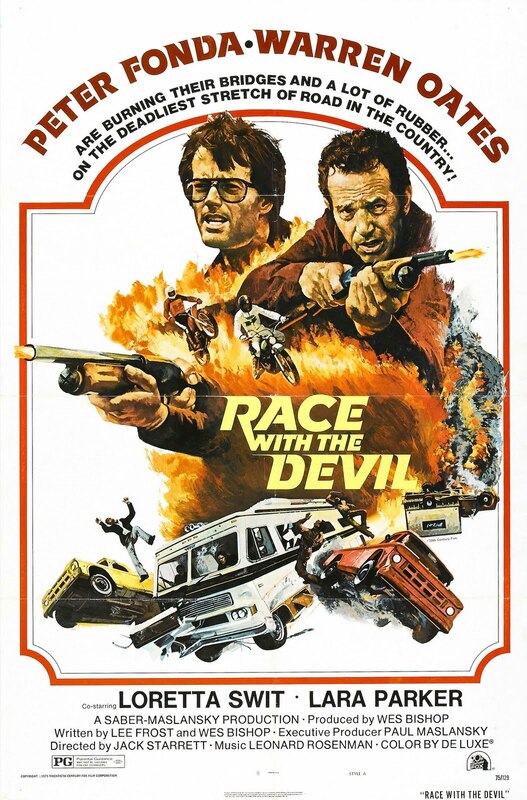 Roger (Peter Fonda) and Frank (Warren Oates) are business partners, and now that their motorcycle shop is finally turning a profit, the two decide it's time to take a vacation. So, Frank purchases a state-of-the-art RV, and with their wives, Alice (Loretta Swit) and Kelly (Lara Parker), they set off for what will hopefully be the vacation of their dreams. But those dreams turn into nightmares when Roger and Frank inadvertently witness a Satanic ceremony in the woods, during which a young girl is murdered . Going straight to the law to report what they've seen, the two learn very quickly that all is not as it seems in this small Texas town, and even the Sheriff (R.G. Armstrong) may be hiding a secret or two. The scene that sets the story in motion, where the two leads witness the murder, is an absolute doozy. For one, the ritual itself is pretty strange, with naked women dancing around a large fire while a man in a horned mask stabs a young girl to death. After seeing all this, Roger and Frank rush back to the RV and take off, just ahead of the pursuing satanists (who realized their secret ceremony wasn't as "secret" as they would have liked). After driving a few hundred yards, the two men start to relax, thinking they've gotten away. Then the RV gets stuck crossing the river. Roger and Frank are able to free it after a few short minutes, but by that time, a handful of cult members have caught up with them, and proceed to destroy the RV's back window. This is the first of many similarly suspenseful chases, all of which are equally as tense as this one. Danger could be lurking around every corner, and can swoop down on the four of them without a moment's notice. And that makes Race With the Devil a real nail-biter, a film that doesn't allow you to let your guard down for a minute. Sounds real good Doctor will have to search it out for a cheap price. Waiting on Episode 2 and the Incideous ratings. I like the Netflix part Human Centipede was real good watched it the night after hearing the podcast. @Jolene: Thanks for stopping by! I really did enjoy RACE WITH THE DEVIL. Along with what I pointed out above, it also had a real 70's feel to it, which is something I always find interesting. Definitely check it out, and be sure to stop back and let me know what you thought of it. Episode #2 is coming two days from now, and we have some pretty lively discussion concerning INCIDIOUS (though I'm not able to say more than that, I'm afraid). So glad you enjoyed THE HUMAN CENTIPEDE. I'll be sure to pass your comment on to Midnight Corey. Thanks again for the comment, and for listening to Horror Jungle. @PFRazer: Thanks for stopping by, and for the comment. Yep...this time tomorrow, it'll be out there! And from the looks of it, it'll be a good one! Thanks again for stopping by, and for listening to Horror Jungle.